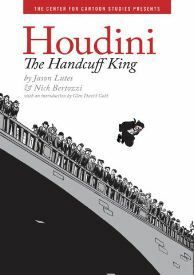 The first in a series of comics biographies of popular figures from off the beaten path of American history that is currently being produced under the aegis of The Center for Cartoon Studies, Houdini, The Handcuff King is a 96-page hardcover volume that amply demonstrates the capacity of comics to clearly and concisely tell a powerful tale -- in this case, about the greatest escape artist who ever lived, Harry Houdini.The story unfolds on a single day, 1 May 1908, in Cambridge, Massachusetts, and every effort is made to capture the era in which it takes place. This is a task for which comics are eminently suitable, provided the practitioners take proper care; and the evidence of this volume makes it clear that Lutes and Bertozzi have done their homework. All the visual details are in order, from the uniforms of the policemen which oversee the drama to the architecture of the buildings amidst which the action is staged; from the handcuffs which are used to bound Houdini to the handbills that are used to promote him; and from the horse drawn carriages that carry Mrs. Houdini to her appointed task to the telephones, elevators, flashpowder illuminations and pocket watches that propel the story forward -- all are realistically rendered, immersing the reader in a vivid experience of the magic of this particular moment in American history. An appendix containing several pages of annotations to more fully flesh out the historical context and a bibliography for those who feel inspired to pursue the story further are also provided. An engaging read for all ages, this volume is especially suitable for getting reluctant readers interested in learning more about the history of American culture. Based on the evidence of this fine work, we find ourselves eagerly anticipating the next volume in the series, devoted to Satchel Paige, one of the greatest baseball players of all time.